You should definitely come to the Hungarian capital, and see all we can offer you here. Goulash, paprika, pálinka…and these are just the well-known ones. We will help you to be more than a tourist, and discover the hidden parts of this amazing city. 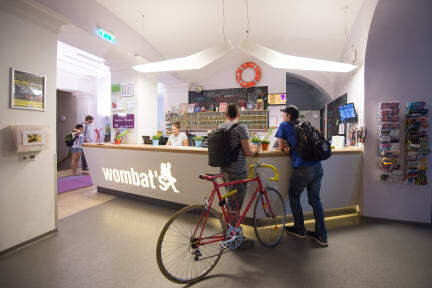 Wombats Budapest is situated in the heart of downtown, surrounded by historical sites, like St Stephen’s Basilica, the Grand Synagogue and the beautiful world heritage Andrássy Avenue.This area was just recently renovated, and after hours became the party centre of the city. Come and experience Budapest with us, and don’t forget our motto: Sleep with the BEST! We offer an all-you-can-eat breakfast for an additional fee, our womBAR serves cheap drinks and food, internet terminals, laundry, 24 hours reception service and - of course - no curfew, no lockout and no stupid rules. All our rooms come with comfy beds, private shower & toilet facilities. Maximum security with smartcard access for the front door, the floors, the rooms and your locker. Property is secured by a strong security guy and CCTV. Balance for the room is due upon arrival. It is only possible to pay cash with the local currency (Hungarian Forint) or credit card (Visa, MasterCard). Please don’t forget to bring an ID card, we will ask for it as a deposit for your key card.